Ogo and Greta make their reality TV debut as FAMOUS cooks (minute 18.05) and Gina, Tyler and Marina get to enjoy the outcome. Hang on until the last 5 minutes to see the Aliotos in action. Once again on TV -- this time it was Gina being interviewed during the Barcelona Supercomputing Center's annual meeting at the Camp Nou. 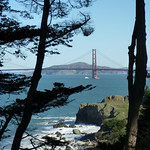 The program was about what European cities like Barcelona are doing to attract scientists and other researchers. The BSC segment starts at 2:52. Go to minute 18:29 to see the story. 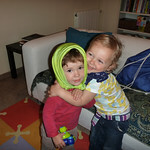 Marina (with Blueberry) and her friend Julia were totally enthralled with the gegants! 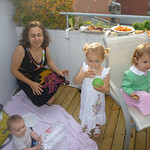 Roderic hosted a very nice going away party for Paolo, Micha and me on the deck of their apartment. Marina had no idea what the party was for, but she had a good time with playing with Paolo's daughter, Cleria, and observing Roderic and Montse's turtle, Llampec. Marina packs in the fun with Malena and Rafaela. 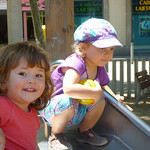 Choo choos and tandem horsie rides ar some of Marina's favorite games. 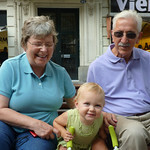 An extended bi-partite visit from my mom and dad (interrupted by a stay in southwest France). 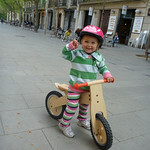 The normal routine of walking in the Barceloneta and going to Buenas Migas and Habaluc was punctuated with a visit to the zoo, a trip to the Parc de l'Oreneta (mini-train rides and ponies), and lots of bike riding. 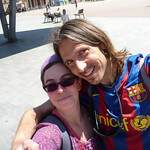 We also were able to get out and go to the Txakolin and hang out with Cris and Oscar at Las Golfas. 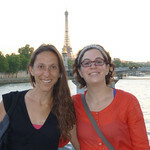 Gina makes a business trip to Nancy with a short stop in Paris... where she meets up with Olga and her mom. What a small world! 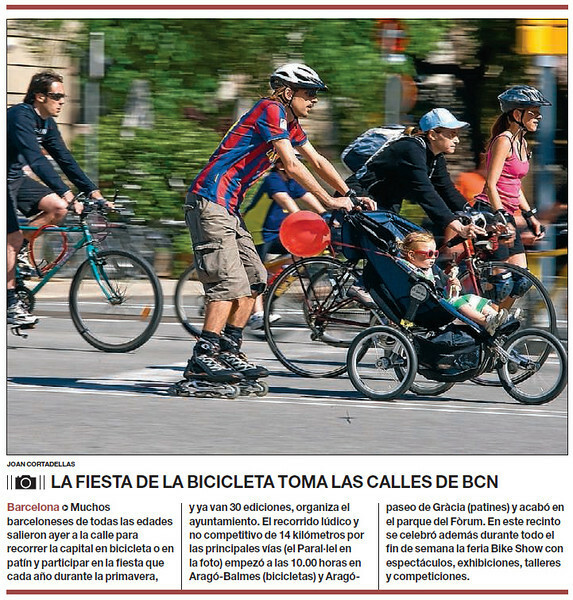 The caption from the May 17th edition of El Periodico (p.27) just about says it all! 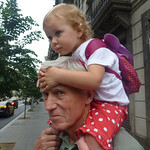 Marina was thrilled by the ride and held on tight to her red balloon the whole way. Gràcies a Oscar per informar-me sobre les noticies! 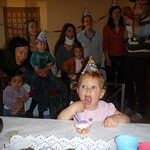 for Malena's party, Marina learned to sing "Happy Birthday", well at least "Happy to you..." AND she fell in love with Hello Kitty. Greta is clearly very proud of Ogo. After all, it's not every day you get to appear on TV. 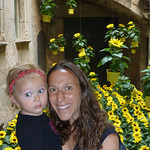 We made the 1.5 hr train trip to Girona to see the annual flower exhibit (each patio puts on a a floral display). It was hard to keep Marina focused on the flowers, but finally there was a combined flower/bubbles exhibit which provided some relief. Playing with Naomi and Malena. It took over an hour to figure out how to add air to the tires (the pump end – for which I cannot find a name – just wouldn’t fit into the valve), but we took Marina out with her bicycle for the first time today. She can still barely touch the ground. Your guess is as good as ours, but we still enjoyed Marina’s serenade on our way to the local bar for a cappuccino in Lucca. She seemed pretty darned pleased with herself as well. We saw a "fuzzy guau guau." Fuzzy – as in the things that stick to your toes from your black socks that come off in the bath water. I don’t know who enjoyed playing with Marina’s new kitchen sand set more, Marina, Gina or Tyler. 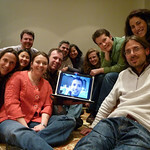 THANKS current Mixed Co members for sending their latest CD to us ALL THE WAY in Barcelona. 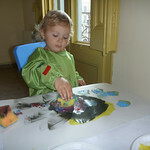 As you can see, Marina enjoyed it and let’s just say she’s getting in some practice time before her class of 2029(?) audition. I’m guessing she’s a top soprano. No one would believe us, but we’ve captured it on video. It’s Marina’s version of One-Two-Three only it’s Two-Three-Two (in Spanish). All she wanted to do was eat the cupcake, but instead MAMMA and PAPPA made her sit through 4 versions of Happy Birthday (English, Spanish, German and Serbian). In the end, Princess Marina had lots of fun and more than a healthy dose of refined sugar (carrot / orange, vanilla lemon and chocolate orange cupcakes) at her If You Give a Cat a Cupcake Party. And everybody knows what happens if you give a cat a cupcake… he might want some sprinkles to go with it. Just when we were all ready for winter to be over, a freak snowstorm hits Barcelona. 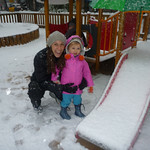 Gina made the first snowflake sighting from her office window (she works near Tibidabo at a slightly higher elevation). Flavia later confirmed the flakes in Eixample and the deal was sealed with a skype from Tyler “It’s snowing on the beach”. Thank goodness the storm hit the day AFTER the BCN Marathon. A sunny windy Saturday at the Barceloneta. We nabbed an inside sea-side table for our regular Buenas Migas Saturday desayuno which led to some creative “rocking out” to the 80’s music inside. 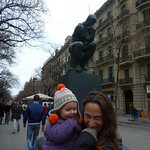 Marina and mommy tried out their own Rodin poses on Rambla Catalunya. The word of the week is allá – the place where mamá and papá need to high-tail, so that Marina can do her thing SOLA. In the video she says ciao, her other fav word! 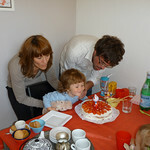 This year’s party included more kiddies and some expert decorators. 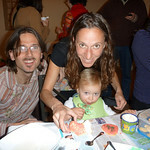 Christina and Oscar showed the most artistic flair while Nika was the most prolific powdered sugar-painter. When she wasn’t stuffing cookies into her mouth, Marina was in charge of sprinkles. In the next day or two I will be updating our blog with posts covering the last five months or so and postdating them to correspond to the approximate date of the events that transpired. I will also be posting more photos of Jan and Santo's visit, Marisa's visit and random Marina photos from before, in between, and after these visits. The reason for the lag is that my work has been a bit all-consuming since the spring and into November due to a project I'm participating called RGASP. 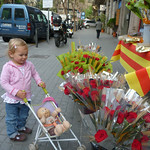 Tyler offered to babysit so that Tía Marisa and I could enjoy the quintessential Catalan festival – the Correfoc del Mercè. We kept our distance from the showers of sparks but neither of us could resist moving in for a closer look when former teen idol Rick Schroeder and family crossed our path. 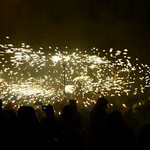 Later we learned that this was an historic Correfoc as someone had finally realized that running a bunch of “fire-breathing” dragon floats through a crowd of people in the center of town just might be a tad bit dangerous. We enjoyed a spur-of-the-moment visit from Tía Marisa thanks to the excellent timing of her change in employment.